Global Entrepreneurship Week is here, but what happens next? 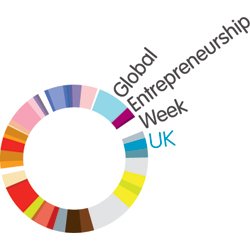 Blog » News & Events » Global Entrepreneurship Week is here…but what happens next? Global Entrepreneurship Week is here…but what happens next? Global Entrepreneurship Week (GEW) is here again and this year the theme is ‘Take a Step Forward’, encouraging current and aspiring entrepreneurs to take a step forward in their plans – whether that’s starting a business, seizing a new opportunity or finding out more about a career in enterprise. With over 3,000 events taking place in the UK alone between Monday 18th and Sunday 24th, and an estimated 300,000+ participants, there’s no doubt that GEW will inspire and encourage people of every age to at least consider starting their own business in the future. You only have to scan through all the Tweets containing the official #GEWfwd hashtag to get a sense of the excitement and buzz that is being generated this week. But what happens on Monday when Global Entrepreneurship Week is over and things return back to normality? That’s when the real hard work begins and when people who were caught up in the euphoria of GEW have to put their ideas and plans into practice if they are really going to get that business off the ground. The good news is that Britain really is a great place to start a business with tonnes of free and low-cost support available around every corner. From the Government all the way down to the grassroots level, there are literally thousands of people and organisations out there who can give you virtual or face-to-face help in starting a business, including mentoring, marketing, sales, networking, writing a business and even funding. The National Enterprise Network (NEN) is the umbrella organisation representing the interests of business advisers and enterprice agencies throughout the country. These are the people who work every day of every week to help pre-start and early stage businesses get going and offer a wide range of services, often for free. There’s so much start-up information available online that it can be hard to know where to begin. Thankfully, our free, 100-page Sage One Start Up Guide by Emma Jones (Founder of Enterprise Nation) does a fantastic job of summarising all the most useful and practical points. Download it now by clicking on the image to the right of this blog. National Enterprise Network members and local authorities often host their own events for start-ups and small businesses but there are bound to be many more in your local area if you start looking and asking around. If there aren’t consider starting your own. The biggest and arguably best networking events are the 4Networking Business Breakfast Meetings that take place up and down the country each week. Managing your finances and keeping on top of your cash flow is regularly cited as the biggest challenge for start-ups and small business owners everywhere so the sooner you can get to grips with this the better. Our Sage One Cashbook, Sage One Accounts and Sage One Payroll software has been created specifically for start-ups and small businesses and includes free 24hr telephone and email support which you can think of as your IT support and training team all rolled into one. From just £5 a month (including a free 30 day trial at the beginning) you can start managing your business finances well within minutes which will increase your chances of business survival. Download our handy Comparison Guide to Sage One accounts in the top right hand corner of this page to see which service is right for you. If Global Entrepreneurship Week has left you wanting more, have no fear because the 30th Business Startup Show takes place next week on Thursday 28th and Friday 29th November at Olympia, London. The event is a showcase for all the great support available for start-ups and small businesses in the UK, includes a wide range of seminars from all the leading speakers in the enterprise world right now and is a great place to pick up a bargain or special offer for your business. The event is free to attend and tickets can be booked online at www.bstartup.com. We (Sage / Sage One) will be exhibiting at the event and running two Start Your Business In A Weekend seminar at 12.30pm on both days. So come to Stand 384 for some free tips and advice on how to manage your business finances better, enjoy our free refreshments and enter a special prize draw! Did you attend a Global Entrepreneurship Week event? If so, what did you think and what did you learn? Please share your thoughts in the comments box below.